The Executive Board of Local 295 created this Scholarship Fund for dependent children of our members with the belief that supporting the education of our children only benefits our society. This year we proudly celebrate our 13 Year Anniversary! With the ever increasing tuition costs, we are honored to be able to help children of our members pursue a program of undergraduate education. Since the creation of the Scholarship Fund in 2007 we are proud to have awarded over 180 Scholarships totaling over $560,000. Applicant MUST be a child or legal dependant of a current IBT Local Union 295 member in good standing for at least the past 12 months and dues must be current. 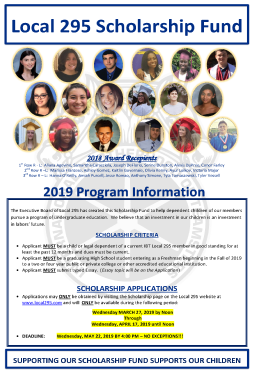 Applicant MUST be a graduating high school student entering as a freshman in the Fall of 2019 to a two or four year public / private college or other accredited educational institution. Applicant MUST submit a typed essay (Essay topic will be on the application). Applications are generally available in the spring of each year. All work locations will be notified when the scholarship program is open, so keep an eye on your Union Bulletin Boards for program dates and instructions on how to obtain an application. 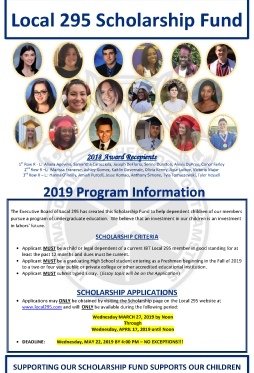 Members are also eligible to apply for scholarships from the Teamsters' James R. Hoffa Memorial Scholarship Fund. An investment in our children is an investment in labors' future.